again in 2014 for the 7th year in a row. CONGRATULATIONS Master Brown's Karate School! Voted "BEST OF THE YEAR "
Welcome to Master Brown's Karate school. Soo Bahk Do is a Martial Art known as a system of self-defense. Through learning its combat-oriented movements, one achieves a high level of mental, spiritual and physical conditioning. This type of exercise helps you to focus your mental, physical and spiritual energy while toning your whole body. Soo Bahk Do draws over 2,000 years of Martial Arts history with origins in Korea. We claim over 50,000 Dans (black belt members known for the unique dark blue color of their belts). Founded by Grandmaster Hwang Kee, of Seoul Korea in 1945, Soo Bahk Do is a combination of both hard and soft styles, combing emphasis on dynamic Korean Kicking techniques for hardness and Oriental hand techniques for its softness and self-defense applications. This blending gives Soo Bahk Do the perfect balance which enables it to be known and respected throughout the world as one of the most effective methods of unarmed self-defense known to man. There has never been a better time to begin training the art of Soo Bahk Do. Whether you want to protect yourself, your loved ones, improve your physical health or explore the discipline and philosophy of a traditional martial art, our certified instructors will help you reach your personal goals. Men, Women and children of all ages benefit from training because there is no competition among classmates. Your personal goals are "Set and Met" without being compared to other practitioners and you do not have to "beat" anyone to achieve your personal growth. Grandmaster Hwang Kee was quoted as saying �Man is at his best when helping others, at his worst when bettering others." We are proud to say that we offer men and women instructors as well as children Dan (Black Belt) members who have passed internationally standardized physical and written tests that will assist you in setting and achieving your martial arts goals. 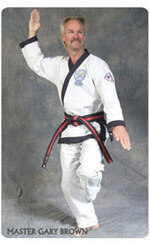 Master Gary has been studying the Martial Art of Soo Bahk Do since 1977. He has been actively teaching Soo Bahk Do since 1983. Since 1985 Master Brown has served on the United States Soo Bahk Do Moo Duk Kwan Federations Board of Directors and has held each executive office including Chairman. He is one of the senior masters in the organization and has served as the Regional Examiner of the Mid-Southeast United States since 1992. Master Brown is responsible for overseeing all black belt testings as well as clinics and camps held within that region of the country. He is a certified teacher by the State of South Carolina and holds a Masters Degree in Education from the University of South Carolina as well as a principal�s certification from the S.C. State Board of Education. Master Brown taught and coached in the public school system in Horry County for 14 years from 1981-1995. It would be my honor to share with you and your family the benefits of the study and training of the martial art of Soo Bahk Do. My goal is to develop well-rounded students with excellent character who will benefit society throughout their lives through the proper physical and mental training of this traditional art. I have dedicated my life to giving everyone the opportunity to reach their greatest potential and goals in life through this experience. I invite you to visit our school to watch and experience one of our classes. I strongly feel you will be glad you did. I look forward to the opportunity of meeting you.